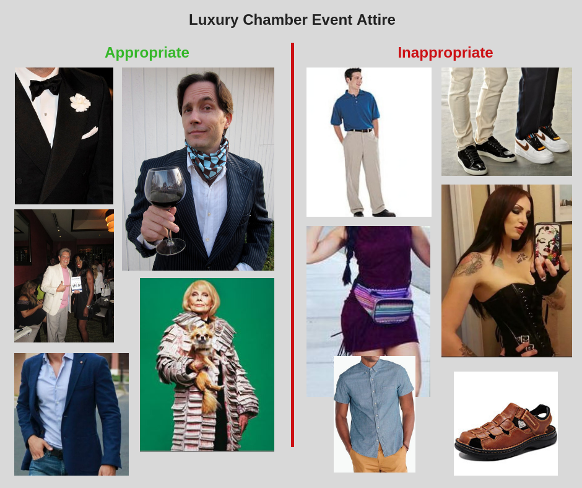 The dress code at Luxury Chamber events may change just slightly based on venue, season and theme. If the event is on a yacht people may dress a little differently than if it were at an art gallery. The general rule of thumb is: DRESS AS NICELY AS YOU POSSIBLY CAN!!! AS IF YOU'RE ATTENDING A WEDDING!!! If you cannot or will not wear a tuxedo to a networking event and simply want to blend in, that is fine also but consider wearing a suit! If its summertime and the event is partially outdoors then consider a sport coat over a tee shirt so that you can remove the sport coat when you get too hot. So long as you have the sport coat folded properly over your left arm you will still look fashionable. We are not against tattoos but please have your dress over your shoulder line! We are not against tennis shoes but please only wear them if our event is at a tennis course. If there is anyone out there who would like education on etiquette, luxury branding and fashion styling we have several people in the chamber who can assist. PLEASE either hire them for a fashion consultation or STAY HOME!! !